It is always advisable to use a waller who is a member of the Dry Stone Walling Association and ensure too that they have public liability insurance. The different elements of a wall - preparation of the site - the foundations - the heart - the face - the ends - the tops - features within - obstacles. After measuring out battens are used for guidance and the width of the base is dependant on the height of the wall. The best foundation for a dry stone wall is stone itself - large flat interlocking stones which will settle over time. The heart of the wall is filled with smaller stones often rubble from a demolished wall. Then there are alternative cappings to the usual upright copes - see the other pages of this site for more examples. There are also ends to think about - do they abut another wall, do you want a pillar, do you want a squared off end, etc. Tom can discuss these options with you. Unique features - You may need to have a bridge over a tree root, you may want a step or bench or alcove within your wall. All these are possible and make your wall more individual. You may also want something inserted into the wall such as a nameplate. The stone - limestone - iron stone - blocks - Stone walls have been built for thousands of years of the local stone. Here in the Cotswolds the two main types of stone used are limestone and ironstone - the latter is found in the North of the county. Tom sources his stone from local quarries and will use as much of your old stone as possible when repairing a wall. Blockwork has become more and more common for the back of retaining walls - where necessary Tom will drill holes to assist drainage. Mortars - lime - cement - Traditionally most dry stone walls did not have any mortar either within them or as a capping. Those that did were mortared with lime which is a natural product and which today is mainly seen on and around buildings within conservation areas. There were good reasons for this as the gaps within the walls allow water to drain through. During freezing conditions this is particularly important as much of the damage done to walls occurs when the water within the mortar, stone and any vegetation freezes and thaws at different rates with consequent cracking and ultimately collapse of the walls. This was particularly evident during the winter of 2012-2013. Where cement has been used in the past Tom will match the style of surrounding walls and of course will build according to the request of the client - as can be seen above. 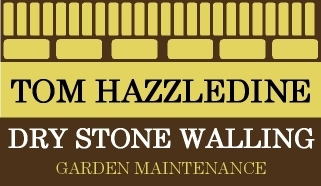 If you are thinking about building a new dry stone wall Tom will be happy to advise you on the most suitable stone and style. However, it is worth referring to the DSWA Dry Stone Wall Specificationsand more speciically those of the Cotswold AONB. Many conventional builders will want to lay a foundation of cement, fill the heart of the wall with mortar and lay the capping on cement. In agreement with the above recommendations Tom prefers to follow the traditional method of laying foundations of large flat stones which will move and settle with the soil over time. Using stones in the heart is also preferable to mortar though where this is used it should contain a proportion of lime. When repairing walls it is usually necessary to match the existing surrounding walls and so cement is often used here but again unmortared caps are always preferred, last longer and look more natural. When lime mortar is used - to ensure that the colour matches the lime mixture will be premixed by the suppliers after analysing a sample. The information referred to above may be of particular interest to local authorities, parish councils and those drawing up specifications for walls for non-residential properties where differing opinions may prevail. Care of your wall - Tom can give you a small leaflet on the care of your wall when the job is complete. The greatest enemy of dry stone walls is in fact vegetation within and on the walls. As the stems grow and force their way between the stones they become dislodged and eventually fall out. 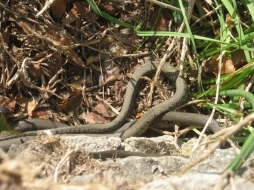 Life in, on and around walls - Dry stone walls provide homes for many plants and animals (some of which are protected) - grass snakes, slow worms, roman and other snails, hibernating newts, small mammals and of course many insects and spiders in the nooks and crannies of walls. They also become colonised by mosses, lichens, ferns and many perennial small flowering plants. 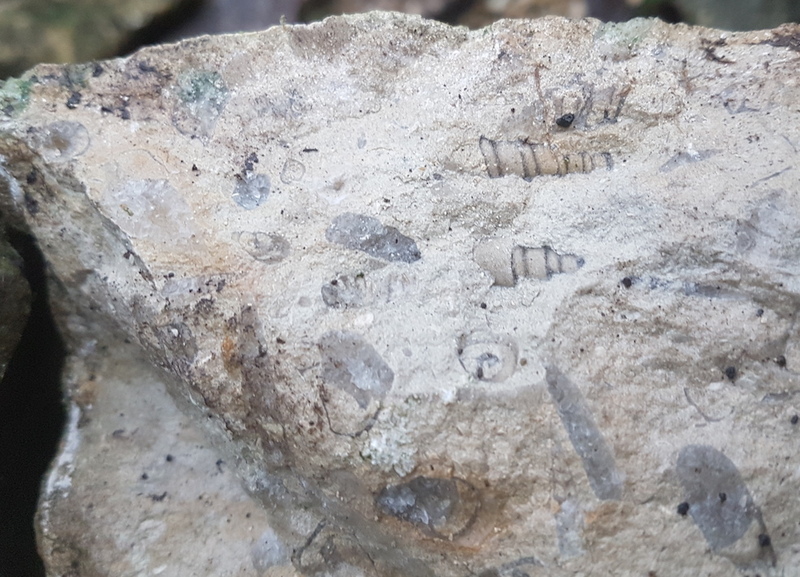 Of course if you look carefully you will see fossils in the stones themselves. 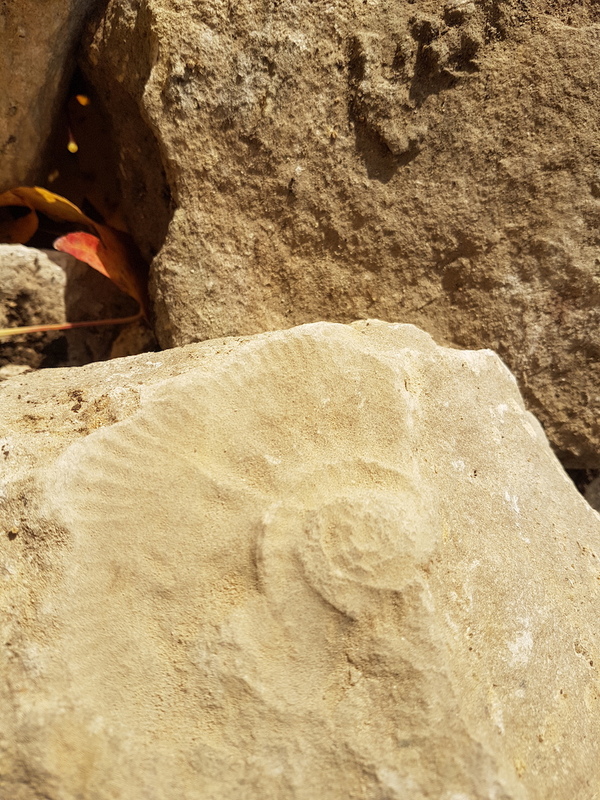 He found this large ammonite recently. The greatest threats - The destructive power of ivy which is difficult to get off dead or alive and often in removing brings down a wall. Try to prevent it getting a hold. Winter weather with alternate freezing and thawing. Tree roots - try not to plant trees too close to walls as their roots - particularly cherry - eventually lift the wall or can cause bulging. Badly built walls often by the untrained who may offer a cheap service are false economy. A well built wall can stand for a hundred years. 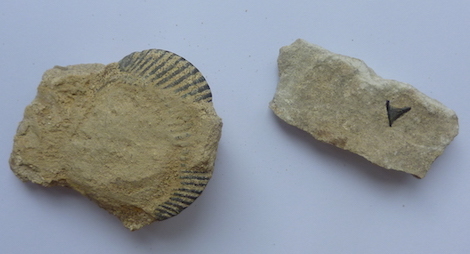 Tom recently found a 1923 sixpence in a wall. The use of cement for foundations or tops is never recommended due to its inability to move - avoid if you can.